Clouds drift over the Boulder Flatirons and Chautauqua Park on a placid spring morning in Colorado. Spring rain and snow has caused a small pond to form near the bottom of the drainage through the meadow. This pond which only forms every few years is short lived. 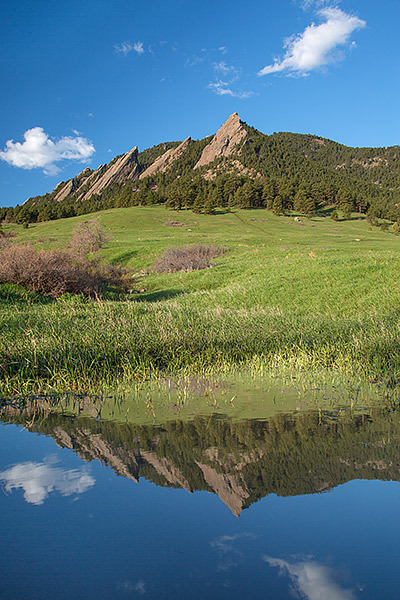 It lasted long enough this spring season to provide this beautiful mirror like reflection of the Flatiron formation above Chautauqua Meadow. Photo © copyright by Thomas Mangan.